The film is proving controversial in India as it is based on the Sri Lankan civil war where emotions are still running high. The Madras high court has cleared the way for the release of the Bollywood movie Madras Cafe refusing to entertain a petition seeking its ban. The judges in their order also said that the filmmakers have the liberty to release the dubbed version of the film as soon as it gets the clearance from the Central Board of Film Certification (CBFC). However the court case against the film will still go ahead with the next hearing on 3rd September. 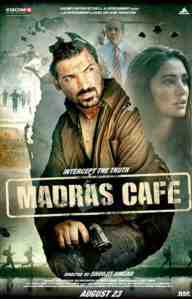 Madras Cafe is seemingly banned in Tamil Nadu for showing the LTTE group in bad light. The spy thriller would not be screened in the state, reported a spokesperson of the Tamil Nadu Film Exhibitors Association. The decision has been unanimously taken by the several pro-Tamil groups and political parties, including BJP. The pro-Tamil group demanded delete of some objectionable scenes but the leading actor of the film John refused to do so. He claimed that if censor board has not objection in any scene of the film then why should he delete those scenes.